Priest Gregoire Legoute, one of the two older priests of the Orthodox Mission in Haiti, talked to the Fund for Assistance to ROCOR about the challenges parishioners and priests face in Haiti. The mission does a lot of work for the education of children in different churches and schools. Thanks to the schools of the mission, more than 800 children and young people receive education. FFA: How many parish schools are there? FGL: The seven schools educate Orthodox and non-Orthodox children. We have volunteers among our parishioners who help us, but most of our professors are paid. Although the salaries are meager, we give them a job. At Foyer d’Amour – (the school for mentally and physically handicapped children – prim. Red.) - where matushka Rose and I teach, we help the children reach an intellectual and physical capacity. We do a lot of social work with the small means that we have. We are able to do all this thanks to you, dear donors. We highly appreciate your gifts. We understand the value of your support. We have been able to do a lot of things thanks to your love, thanks to your generosity. FFA: Why is it important to support the mission? FGL: Most of our parishioners are unemployed. Finding work is not an easy feat in Haiti, even if you have several diplomas. We do not have what we need for further development ourselves. FFA: What have been some of the positive changes that you have been able to implement thanks to FFA donors? FGL: Thanks to your generosity, we have been able to buy a big plot of land where we plan to build a church of St John of Shanghai and San Francisco in Les Cayes, in the south of Haiti. We bought a plot of land for building a church of St Augustin in Jacmel. We bought a plot of land in Maissade for building a church of St Irine of Lyon. We pay rent for our churches and schools annually. Fr. Gregoire with his parishioners. We are constructing buildings that have allowed us to have a number of activities with the children. And for those who have lost their husbands, their houses during the terrible earthquake of January 12, 2012, we were able to pay their rent and pay for the education of their children. The priests and deacons receive their monthly salary. Our three seminarians in Paris: Priest Augustin, Reader Martin and Reader Peter have received help to continue their studies. We have been able to accomplish all of this thanks to the help of the Fund for Assistance. We are very thankful. These were acts of love. Thank you so much. Without this support the life of these families would have been much more difficult. You are daily in our prayers. Thank you again. FFA: How many people have you been able to help in the mission and how many people do you help daily? It is difficult to say how many people we help daily. But we have people coming for help daily, be it for something to eat, to help them buy medication, or to help them pay for their children’s school. Members of the community, parishioners in need – they all think that the priest will be able to give them at least a little something. We – the priests and the matushkas – work with the poorest people in our country, with the handicapped, who were rejected not just by the society at large, but also often, by their own families. Every day people come to us asking for something to eat, for money to buy medication, to pay rent or school fees for their children. The life of religious people in Haiti is not easy with constant daily demands. We give them our clothes, if they ask for them, food (mostly rice and peas) that we have at the school cantine, some money, and – most importantly – hope. The mission is well-known in Haiti for its acts of charity. FFA: How much does it cost to feed someone for a day? FGL: Life is very expensive in Haiti. You work for gourdes (Haitian National currency. 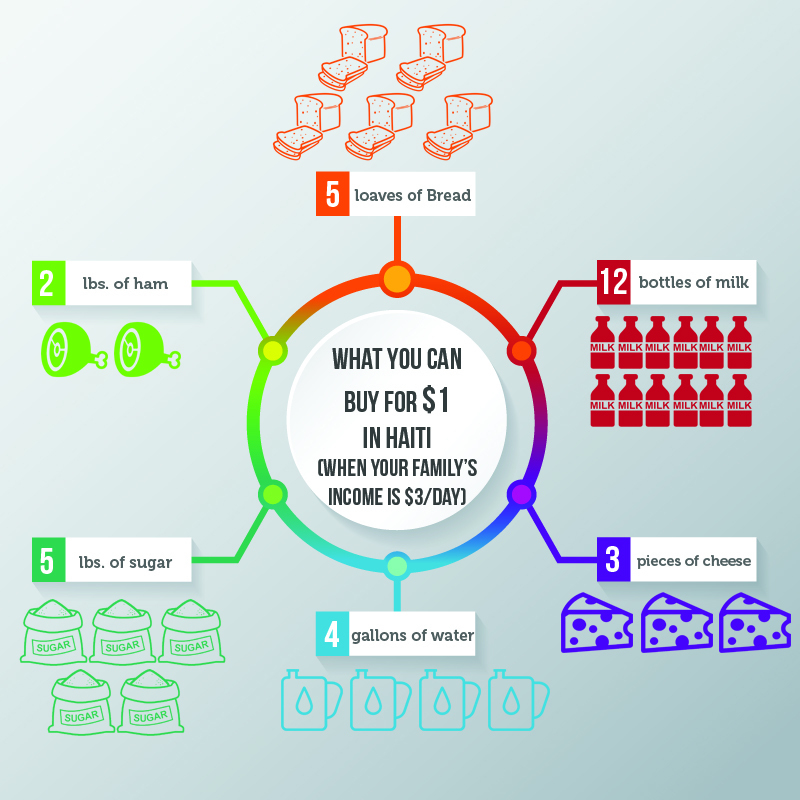 55 Haitian Gourdes =$1 U.S. – ed., July 2015), but you buy in dollars. Because of the drought, the plantations have been lost. There are political problems and insecurity, which deter investors. Having employment is something that is very rare. You need at least $40 U.S. a day to feed one person. If you go to a restaurant, it will, of course, be much more expensive. At the same time, most people survive on $1.99 a day. This should illustrate the plight of the majority of our people, who do not have jobs, who make very little money, who cannot make ends meet even if they do work, but do not make enough to support themselves. We have very little industry in Haiti, there is political instability, which scares away the investors. We live off agriculture, but the country does not produce enough to feed its people. We have to buy almost everything. Climate change makes the situation even worse. At times there is a long drought, unbearable heat, and not enough water. At other times it rains and rains, floods destroy the harvest, recurring cyclones create fear. In the absense of social programs, healthcare costs are very high. You need from 350 to 500 HG for a doctor’s visits. School fees are also very high in Haiti. FFA: How many members does the mission have? FGL: Today we have over 3,000 members. FFA: Why are Haitians interested in the Orthodox Church? FGL: We think that it has to do with the spiritual quality of the Church that attracts everyone. Also there is the attraction of being a part of a family. Everyone is accessible. You can talk to the priests, the matushki, and anyone in church. People say that they everyone is always very approachable, even the foreigners, even the Vladyka (Metropolitan Hilarion, First Hierach of the ROCOR – ed). This is what attracts a lot of people to the Church. Students at Foyer d'Amour School for mentally and physically handicapped students. FFA: What positive changes have occurred in the mission since the earthquake thanks to the donors of the FFA? FGL: We have purchased three lots to build parishes: in Maissade, another one in Les Cayes for the church of St John of San Francisco, and a third in Leogane for the church of St. Augustin. This was of great importance to us. We are hoping to start building the churches. There is a skilled construction worker, Alexandre, a parishioner of the St Prince Vladimir Church in Miami, FL. He came to Haiti, and stayed with us for almost three months and made iconostasis for four churches. This was absolutely extraordinary for us, because it has categorically changed the aspect of the churches. There is also a plan of supporting families of the poor in our parishes. Nearly 30 families are benefitting from monthly support. We want to thank donors, who have allowed us to receive this support of our families. Priests, matushki and all members of the Orthodox Mission in Haiti are very grateful to the donors of the FFA. We thank all donors to the Fund for Assistance. Without this support the life of these families would have been much more difficult. Thank you for your support, you are always in our prayers. May God bless you all. 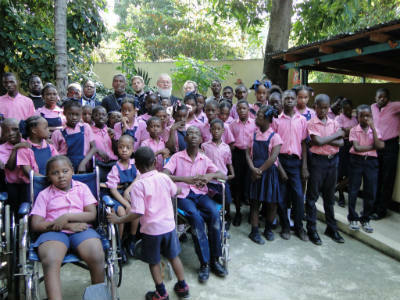 Please continue to support the Orthodox Mission in Haiti!